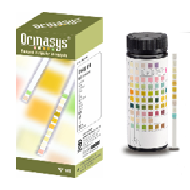 Orinasys (Orinasys B10,B10 Plus,4S,GP,GK) is a reagent strip for Urinalysis. Orinasys helps to ensure accurate measurements both visually and automatically. •Covers all the parameters necessary for urine testing. A maximum of 10 items can be measured simultaneously. •Choose the combination which best suits your testing needs.